Kris Letang is best D-man ON THE TEAM! And if you've joined the haters that have come out of the woodwork recently, you're naïve at best and agenda driven at worst! Who really expected Letang to be even half the player he was two years ago when he had 67 points?! Especially 8 MONTHS after undergoing surgery to repair a herniated disc in his neck. So, the idea that he was simply going to be operated on and jump back into to pushing though the following workouts is funny......And not funny like "haha"........Funny like "you're a moron". Frankly, I'm just glad he's back on the ice. Aside from god given talent, no other D-man on the team with the exception of Justin Schultz can consistently handle the responsibility of skating the puck out the defensive zone if necessary. And as for the turnovers, I couldn't care less. Really! I would rather watch Letang on the wrong side of the +/- column all year than spend another period suffering through more Rob Scuderi type clones. The only reason Ron Hainsey was successful within the Penguin's system last year was because he was excellent at minimizing high danger scoring chances. 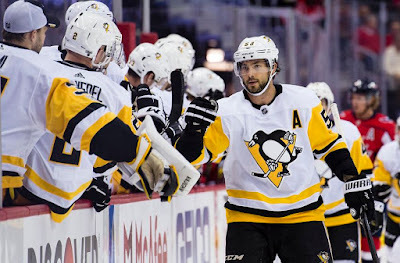 The reality is that without Schultz to eat up bigger minutes and take over power play duties from Letang, the Penguins wouldhave never made it past the first round last year. Last night marked the return of Mark Andre Fleury to PPG paints arena and god bless him. He's a great man and a good goaltender. However, if you were rooting for Fleury to play well and Letang to be traded eventually because of turnovers and a lack of jump at times, the problem is not Letang, it's you! I appreciated Fleury for the man he is and teammate he was but if the Penguins would have lit him up for 6 or 7 goals my inner fan would have slept a lot more soundly than after watching the game that transpired. This article may sound like it's rooted in frustration and that's fine because it is. I'm amazed at the amount of head in the sand "defensemen are supposed to play defense" type fans who would rather watch Ian Cole lay a hit than Kris Letang try to create some kind of rush from the backend so #87, #71, or #81 don't have to do all the work while three opposing players gang up on them. The object of game is still to score goals after all. To create moments that the average beer-league player cannot. And whether you like it or not, Letang is the best defenseman suited to help the Penguins do that. Personally, that's all I really care about. And, since those type of moments tend to decide games, it shouldn't be too hard to recall that one of those moments decided one of the biggest games the Penguins have played in recent memory.